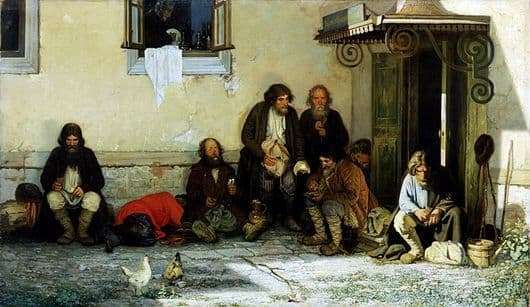 Grigory Myasoyedov wrote this work in 1872. This painting became the hallmark of the Wanderer artist. The artist relied when writing this work on local materials. Before the audience appears reformed Russia. Local governments have just begun to be created in the form of zemstvos. Chose here and the peasants. But they had a low property qualification, so there were very few of them. The plot is extremely simple. The artist decided to display the discrepancy between the provisions, according to the social situation. Shows a quiet provincial town. In the foreground is the building of the district council. It seems simple. The whole house is not shown, but only in the picture there is an image of the light wall of the Zemstvo government. Peasant deputies decided to have dinner. The stuffy rooms do not seduce the peasants, and the neighborhood with the “noble” representatives of the zemstvos does not satisfy them. Therefore, they decided to dine in the fresh air. The artist portrayed someone already had a dinner and dormant, and someone who continues the meager meal, with a simple village provisions. The food is simple. Someone has dry bread. Another has bread with salt and a bunch of green onions. It can be seen that in the building of the provincial council they also finished lunch by the actions of the waiter, who rearranges the dishes and by the wine bottles. This is where the contrast of poverty and wealth is observed. The main characters of the picture – the peasants, the artist gave the characteristic features. One – slyness, sharpness. Another is the feeling of genuine spiritual nobility. The third is insult. Here, the presence of a Nekrasov’s work about who is good in Russia. And all the characters in the picture think about the same thing – they understand that justice cannot be achieved here. The master is not going to make a conclusion on the objective scene, he is pushing his viewers to this.